France 1871-1914 followed well behind Bismarckian Germany, as well as Great Britain, in developing the welfare state including public health. Tuberculosis was the most dreaded disease of the day, especially striking young people in their 20s. Germany set up vigorous measures of public hygiene and public sanatoria, but France let private physicians handle the problem, which left it with a much higher death rate. The French medical profession jealously guarded its prerogatives, and public health activists were not as well organized or as influential as in Germany, Britain or the United States. For example, there was a long battle over a public health law which began in the 1880s as a campaign to reorganize the nation's health services, to require the registration of infectious diseases, to mandate quarantines, and to improve the deficient health and housing legislation of 1850. However the reformers met opposition from bureaucrats, politicians, and physicians. Because it was so threatening to so many interests, the proposal was debated and postponed for 20 years before becoming law in 1902. Success finally came when the government realized that contagious diseases had a national security impact in weakening military recruits, and keeping the population population growth rate well below Germany's. According to various experts, the battered state of the French social security system's finances is causing the growth of France's health care expenses. To control expenses, these experts recommend a reorganization of access to health care providers, revisions to pertinent laws, a repossession by CNAMTS of the continued development of medicines, and the democratization of budgetary arbitration to counter pressure from the pharmaceutical industry. After paying the doctor's or dentist's fee, a proportion is reimbursed. This is around 75 to 80%, but can be as much as 100% (if you have a long duration medical problem such as a cancer). The balance is effectively a co-payment paid by the patient but it can also be recovered if the patient pays a regular premium to a voluntary health insurance scheme (more than 99% of the population as every worker is entitled, per law, to access to a company subsidized plan). Most of them are managed by non-for-profit groups. Under recent rules (the coordinated consultation procedure, in French: "parcours de soins coordonné"), general practitioners ("médecin généraliste" or "docteur") are expected to act as "gate keepers" who refer patients to a specialist or a hospital when necessary. However the system offers free choice of the reference doctor, which is not restricted to only general practitioner and may still be a specialist or a doctor in a public or private hospital. The goal is to limit the number of consultations for the same illness. The incentive is financial in that expenses are reimbursed at much lower rates for patients who go directly to another doctor (except for dentists, ophthalmologists, gynaecologists and psychiatrists); vital emergencies are still exempt from requiring the advice from the reference doctor, which will be informed later. As costs are borne by the patient and then reimbursed (most of the time on the spot as all doctors and drugstores can read the "Carte Vitale", a smart card with all information on the patient and the co-insurance company) , patients have freedom of choice of where to receive health care services. The global system (social security system) will cover 70% of the global cost unless you have an ALD (long duration medical problem) such as cancer or diabetes where all expenses are covered (100%). People can subscribe to a "mutuelle" (non profit insurance) or a private for-profit insurance for additional cover. All workers have access to a specific plan where their company has to pay at least 50% of the cost. Prices range from 10€/month (full basic coverage i.e. 100% of all expenses and medicines) to 100€/month (luxury coverage including high level chamber while in hospital, professors for children if they have to remain at home, housemaid at home if needed...). 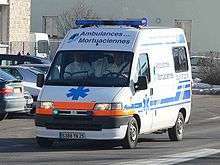 While French doctors only earn about 60% of what American doctors make, their expenses are reduced because they pay no tuition for medical school (cost for a year range from €200 to 500 but students get paid during their internships in hospitals) and malpractice insurance is less costly compared with the United States (as all doctors subscribe to the same fund). The French National Insurance system also pays for a part of social security taxes owed by doctors that agree to charge the government-approved fees. In a comparison of funding arrangements, institutions an-d level of resources, prevention of long waiting lists has been attributed by Siciliani and Hurst to a high number of doctors and hospital beds, combined with fee-for-service funding of doctors and private hospitals. Long waits apparently remain unusual. However, some moderate waits have developed. French patients were relatively unlikely to report forgoing care because of waits (Eurostat, 2012). However, there are wait times for some procedures such as MRI scans, perhaps relating to low numbers of scanners, and in certain areas for certain specialties like ophthalmology, partly relating to unequal distributions of doctors (Chevreul et al, 2015, p. 182). The Commonwealth Fund 2010 Health Policy Survey in 11 Countries reported found that relatively high percentages reported waiting more than 4 weeks to see their most recent specialist appointment in France, higher than New Zealand, the U.K and Australia. It did not state the percentage of appointments taking this long, or the number of appointments available. 53% took less than 1 month (relatively low), and 28% more than 2 months. However, while moderate waits for elective surgery were common (only 46% said they'd waited less than 1 month) the percentage reporting 4 month+ waits was only 7%, low and similar to the U . S, Switzerland, and the Netherlands. 1 2 "World Health Organization Assesses the World's Health Systems". Who.int. 8 December 2010. Retrieved 6 January 2012. ↑ "WHO country facts: France". Who.int. Retrieved 11 November 2013. ↑ "Medical News Today". Medical News Today. Retrieved 6 January 2012. ↑ "France-prel.indd" (PDF). Retrieved 6 January 2012. ↑ "L'assurance maladie". Ameli.fr. Retrieved 6 January 2012. ↑ Cline, Mary (15 April 2008). "ABC News". Abcnews.go.com. Retrieved 6 January 2012. ↑ "Salon.com". Open.salon.com. 18 June 2009. Retrieved 6 January 2012. ↑ Rodwin, V. G. (10 September 2002). "NIH & American Journal of Public Health". American Journal of Public Health. 93 (1): 31–37. doi:10.2105/ajph.93.1.31. PMC 1447687 . PMID 12511380. 1 2 "Health Care Lessons From France". NPR. Retrieved 6 January 2012. ↑ Gauthier, David (7 August 2009). "Wall Street Journal". The Wall Street Journal. Retrieved 6 January 2012. ↑ "A Brief History blog". Abriefhistory.org. 8 August 2009. Retrieved 6 January 2012. ↑ "Paris Voice Webzine". Parisvoice.com. Retrieved 6 January 2012. ↑ "French Embassy to the US". Ambafrance-us.org. Retrieved 6 January 2012. ↑ Yglesias, Matthew (13 July 2009). "Matthew Yglesias article". Yglesias.thinkprogress.org. Retrieved 6 January 2012. ↑ Drum, Kevin (6 August 2009). "Mother Jones Magazine". M.motherjones.com. Retrieved 6 January 2012. ↑ Armand A. Lefemine MD (2012). "US and World Medical Care". ↑ Paul V. Dutton. "HEALTH CARE IN FRANCE AND THE UNITED STATES:LEARNING FROM EACH OTHER" (pdf). ↑ Siciliani, L., & Hurst, J. (2003). Explaining Waiting Times Variations for Elective Surgery across OECD Countries. 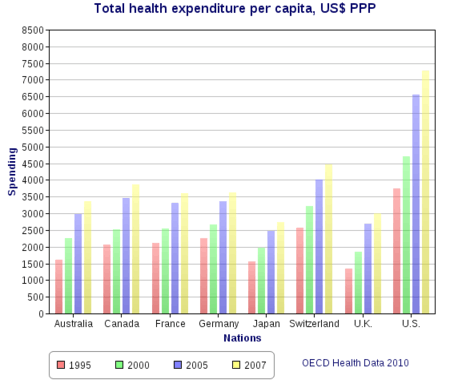 https://search.oecd.org/els/health-systems/17256025.pdf: Organisation de Coopération et de Développement Economiques Organisation for Economic Co-operation and Development. pp. 69–70.